Last week I took a couple of ski runs with a 22-year-old woman named Cassie. This is her second winter on skis, and she spends each Wednesday afternoon with her instructors, Red and Karen, gradually improving her skiing skills and discussing Sesame Street on the chairlift. Cassie is one of the scores of folks who enjoy a variety of sporting activities with the help of the Adaptive Sports Partners of the North Country. Her skiing will likely always be restricted to the Tuckerbrook learning area at Cannon Mountain, where the rust-colored parkas of ASPNC’s volunteer instructors dot the white slopes every day. Seeing those volunteers leading folks with a variety of disabilities down the slopes this winter has caused me to think of a woman who overcame many life obstacles with a mantra of “Adaptability is Everything,” and for whom the Paulie’s Folly trail on Cannon’s “Front Five” is named. With a mission of providing year-round recreation opportunities to people with disabilities – some lifelong challenges, others the result of disease or injury – the ASPNC helps more than 100 people each year experience skiing, hiking, soccer, bicycling, and other outings. Participants range from children as young as 5 years old to adults over age 70. The ASPNC’s goal is to help others get out and enjoy life, and to offer support and guidance in the endeavor to adapt to and overcome their disabilities. I have always reveled in the beauty of the mountains and the exhilaration of skiing down or hiking up them, and I fully understand the thrill and inspiration that can be found in the outdoors. So I admire both the dedication of ASPNC volunteers and the courage of the people who look beyond their own limitations to try something new, and to rely on others for the support they need. “Adaptability is Everything” is the motto Paulie Hannah adopted after she contracted polio as a young woman. Paulie was a ski racer, a farmer, a wife, and mother of four young children when the crippling disease put her in a wheelchair. Despite her disability, Paulie lived a full life, managing the family farm in Sugar Hill, raising money for local and national ski racing, raising a family, creating art. In every photograph I’ve seen of Paulie, she is smiling a wide, infectious grin. Surely she and her family faced numerous challenges throughout her life, but she adapted to the restraints of polio for 50 years, living into her 80s. Perhaps if there had been an organization like ASPNC in the 1950s, Paulie would have been able to ski the trail named in her honor, again experiencing first-hand the thrill of flying downhill. 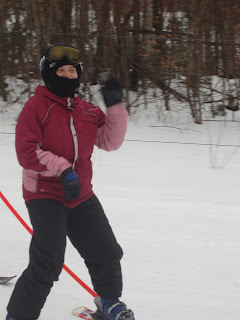 The day I tagged along with Cassie, Red (a longtime professional ski instructor and retired civil engineer) and Karen (an occupational therapist by trade) used a variety of tools and tricks to help Cassie improve her skiing – and her confidence. By the second run, Cassie was making snowplow turns without the tethers that had been attached to her skis to allow Karen to help her turn. With help and encouragement, Cassie was making her own turns, and the smile on her face was testament to her own thrill of accomplishment. My brother and his girlfriend got a new puppy this weekend. She is 8 pounds of pure, fluffy, black-and-white, wet-nosed joy named Banshee. Banshee is an Icelandic sheepdog, the first specific-breed dog my brother has ever had. 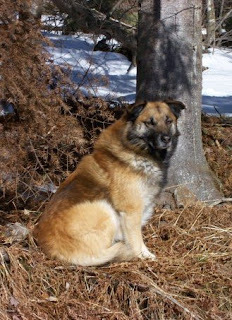 We were a mutt family growing up, and when Billy was living in Colorado, he got a puppy whose mother was some kind of Norwegian elkhound mix and whose father was unknown. He named that puppy Teocali, after one of the most beautiful mountains near the town where we both lived for several years. Teo went everywhere with Bill, including to New Hampshire when he moved back East. Anyone who knows my brother also knew Teo, because Teo continued to go everywhere with Billy. He spent a lot of time camped out in the pickup truck – in front of the Village Store, on the job site, outside the bar. From his perch in the truck, Teo would acknowledge you only if you were in his inner circle. If not, or if he simply didn’t feel social at that moment, he’d cast a bored sideways glance and keep staring out the window, looking for Billy. Or he’d hop calmly into the back seat and lie down. He was playful, but not overly exuberant. He didn’t jump around or lick people or clamor for attention. Teo just did what Teo wanted to do, which was basically hang out with Billy. Or play fetch. Or stare at cats. That was one of his favorite pastimes from puppyhood, just staring at cats. Not trying to chase them or play with them, just staring. Billy thinks it was some kind of herding instinct. Teo was so nonchalantly charming, so unconventionally handsome, that a virtual stranger asked Bill if she could breed him with her female Chow. Billy got pick of the litter, and now my parents have Teo’s son, Gunnison, named for the town where Billy lived when Teo was a puppy. When Teo died two summers ago, it was crushing. For a decade he’d been my brother’s co-pilot, his friend, and a constant companion through many changes. Some people, when they lose a pet, want to get another one as soon as possible, seeking to fill that hole in a life and a heart. For others, there is no filling the hole, and the reminders are everywhere – the water bowl you can’t quite bring yourself to put away, the leash hung behind an old coat and discovered months later, a stray tuft of fur blown into some rarely cleaned corner, the loneliness of a run or a hike without canine companionship, the empty spot in the truck. My father in law keeps in his office the ashes from his beloved golden retriever, Alex, decades after Alex ceased to run around chasing his tail. So much was Alex loved, that my husband and I now have a wonderful golden, and both his siblings have goldens. For their family, there is no other breed. For my father-in-law, there is no other dog, and since Alex, he has never brought home another pup. We all knew there was no way another dog could ever fill the hole Teo left. Billy and Laura buried Teo in their back yard. They planted a tree and created a garden there. Those actions were about both grief and remembrance. Then two weeks ago, Billy started talking about a breed of dog he’d seen in a National Geographic article. Icelandic sheepdogs seemed a lot like Teo – the same wise look and calm expression, the same unexuberant joy, the same disheveled mane of thick fur standing out around the neck. They even have similar personality traits – smart, loyal, patient, mellow. Saturday Banshee came home. 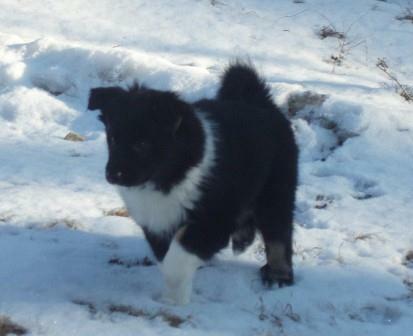 An Icelandic sheepdog from Limerick, Maine. A happy little bundle who played with my smitten children, sniffed at the snow, and curiously chased after the three cats of the household. She’ll grow to about the same size Teo was and will probably sleep on his old bed and drink from his old water bowl. She’ll learn that cats have sharp claws, and to stay away from the electric fence around the pig enclosure. On hot days, perhaps she’ll rest in the shade of Teo’s tree. And I bet she’s going to be great at fetch. Banshee will never be like Teo was. She’ll be like herself. She’s already stealing hearts and causing spontaneous outbreaks of grinning. That’s what puppies do. They create joy. And if we’re lucky, they remind us of the dogs we’ve loved before, and those empty spaces in our hearts start to fill in just a little bit.